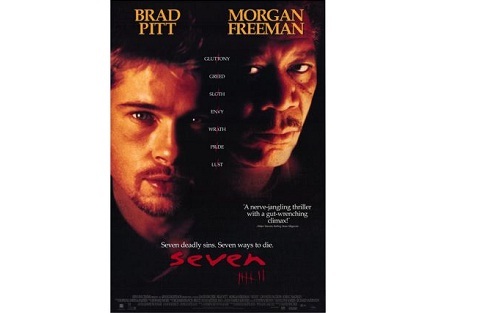 To symbolize the gift on the seventh day of Christmas (seven swans a-swimming) we decided to focus on the number not the gift, and we selected the movie Se7en. David Fincher’s first movie as a feature length director was Alien 3, which was a borderline disaster, but his breakout performance was his next movie Se7en. Every scene jumps off the screen. And the suspense builds throughout the movie as Detective Mills (Brad Pitt) and Detective Somerset (Morgan Freeman) discover each new crime scene, rake over the clues, and get closer the finding the killer. As they discover each new body, the unnamed city they are in is constantly rainy, dark, and depressing (this style is blatantly copied in the American version of The Killing). As usual, Fincher gets the most out of his cast, which included Brad Pitt, Morgan Freeman, and Gwyneth Paltrow. The actor who played the killer, one of Hollywood’s best, was not billed in the movie posters, and did no promotion for the movie so that it would be a surprise to the audience, at least to those who saw it opening weekend. I will continue this tradition and encourage those of you who have not seen it, not to look it up, but instead to watch the movie to find out.